See you at our booth at the Seafood Expo North America 2019! on the market today because they are grown in a naturally icy cold, clear Newfoundland waters. Iceberg Select™ Mussels are high in protein, low in fat, and are an above average source of heart-healthy Omega-3 fatty acids. 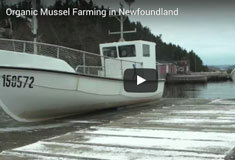 This is our commitment to green practices and pure organic mussels. As the arctic breeze blows across Labrador to the coast of Newfoundland, thousands of mussels sway in the clear, iceberg chilled water deep beneath the ocean’s surface. These are Iceberg SelectTM mussels, the finest in the world. Naturally the right choice for you.